Canadian Born players have been on the front stage in the first half of the NCAA basketball season. Last season, Canadian Freshman Oshae Brissett and Lindell Wigginton found immediate success. Due to shooting struggles and injuries respectively, both players have hit bumps in the road. Still, both players have elite potential and are future NBA players. 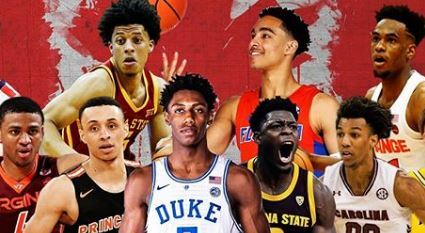 Meanwhile, a fresh crop of young Canadian talent has been infused across major college basketball. RJ Barrett was the only five star ranked Canadian talent across all major recruiting databases, yet this season has again showed us that Canadian talent continues to be slept on, and sheerly underrated. Proving so, there are three Canadian players are up for the Wooden Award, NCAA basketball’s player of the year award. Barrett was ranked as the number one player in the whole country, and has proved his stock. Duke is ranked as the number one team in the nation, and is home to three of the top prospects in the upcoming draft. Barrett has started every game in his career, and plays 33 minutes per game. He is putting up 23.4 points and 6.9 rebounds per game. The former Naismith High School Player of the Year has won ACC Player of the Week honors as well as ACC Freshman of the week honors. Barrett is projected to be a top two pick in the 2019 NBA Draft, continuing a trend of top end Canadian talent finding the NBA rather quickly. Barrett is one of 25 players up for the Wooden Award. Alexander-Walker was rated as top 40 prospect in the class of 2017 in the U. S. Thus far, he has doubled down on a strong freshman campaign with an outstanding sophomore season. The Hokies are ranked in the top ten in the nation, largely due to NAW’s improvement. Nickeil consistently has been a player to make the rest of his team better, and half way through this season, he is putting 18 points, 4.1 boards and 3.5 assists in 32.5 minutes per game. Alexander-Walker is one of 25 players up for the Wooden Award. Going along with multiple other Canadian prospects, Alexander-Walker has seen a huge stock boost. He is projected to be picked between 8 and 20 in the upcoming NBA draft. Clarke transferred to Gonzaga after two strong seasons at San Jose State. The competition level certainly ticked up, but Clarke has stepped up his game in a big way. The Zags are ranked in the top five in the country, with a very balanced scoring attack. Clarke is putting up 17 points, 8.2 rebounds and 3.2 blocks per game. The 6 foot 8 versatile forward has put himself squarely on the NBA Draft radar. With the ability to go up and over anyone and his defensive intangibles, proved by some outlandish highlights Clarke has produced thus far, scouts are intrigued by the long term potential of Clarke on both ends of the court. Most sources have Clarke projected in the first round of the upcoming draft. Dort, a former top 30 prospect in the U.S and four star combo guard, has brought Bobby Hurley and the ASU Sun Devils an influx of scoring, leadership and toughness. At 6 foot 4 and 215 pounds, the Québec native has drawn attention for his willingness to score and toughness when attacking the rim. Proving to be a mismatch from day one in Tempe, Dort has put up 17.1 points, 4.7 boards and 2.4 assists in 31.8 minutes per game. Consequently, Dort has drawn the attention of NBA scouts. Due to the Sun Devils inconsistency thus far, Dort’s stock has fluctuated. If he does choose to leave Arizona State after one season, he is likely to be selected in the back end of the first round between picks 20 and 30. Bradzeikis was ranked in the top 40 of the 2018 class in the U. S and 6th overall for North Pole Hoops in Canada. Michigan was undefeated until meeting Wisconsin, and ranked second in the country. Bradzeikis leads the Wolverines in scoring, but playing the fourth most minutes on the team. Per 40 minutes, Ignas is putting up 21.4 points and 7.3 rebounds. Since suiting up in Ann Arbor, Bradzeikis has outplayed his ranking. He leads the Wolverines in scoring and is second in rebounding. If Bradzeikis chooses to be one and done at Michigan, he is a likely first round pick. His basketball IQ, toughness, versatility at his 6 foot 8 size and feel for the game stand out in the Big Ten. Bradzeikis is up for the Wooden Award, and has been the recipient of Big Ten Freshman of the Week three times. Heavy Lies the Crown: Ravens Reclaim title!